I’m a pretty happy Dropbox user who spends a lot of time on the road. But I sometimes forget to put the files I’m working on at the office in my Dropbox folder. Any hints on ways to ensure this doesn’t happen? I can offer a couple, yes. The first is dead simple but it will cost you $35. That $35 solution is St. Clair Software’s Default Folder X. 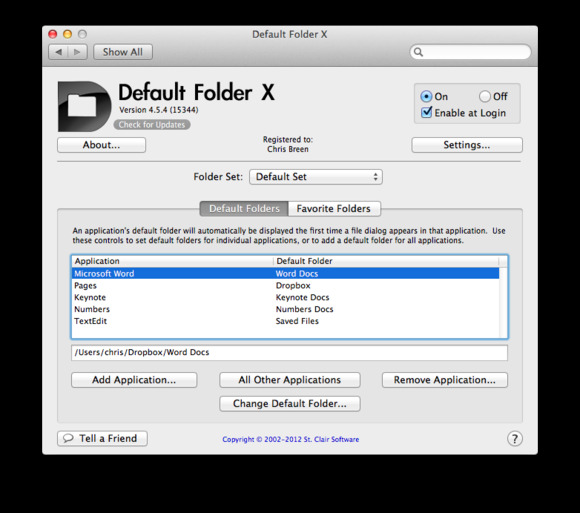 This much-beloved-by-Macworld’s-Dan-Frakes utility allows you to choose a… well, default folder for saving documents within any application. For example, if the Excel documents you work on are created with your job in mind, you can configure Default Folder so that these documents are saved to your Dropbox folder (or, better yet, a folder within it) by default. What makes this better yet is that Default Folder can create a separate default destination for each application you use (see the image above). So, use an Excel Docs folder within your Dropbox folder for your spreadsheets, Word Docs for those files, and a PDFs Folder for… well, you know. Another benefit of Default Folder is that it can work around Mountain Lion’s desire to save certain kinds of documents to iCloud (those documents spawned from the iWork applications, TextEdit, and Preview). In the past, Default Folder couldn’t defeat the Documents in the Cloud feature that made iCloud the default destination for saving documents within these applications. It now can. Or you can save the $35 by slightly rejiggering the Finder and changing your work habits. While I still greatly prefer the Default Folder solution, you can instead locate your Dropbox folder (placed within your user folder by default) and drag it into the top position in a Finder window’s sidebar. Now, when you save a file within any application, click on the Where pop-up menu in a Save dialog box and you’ll find that your Dropbox folder is at the top of the list.